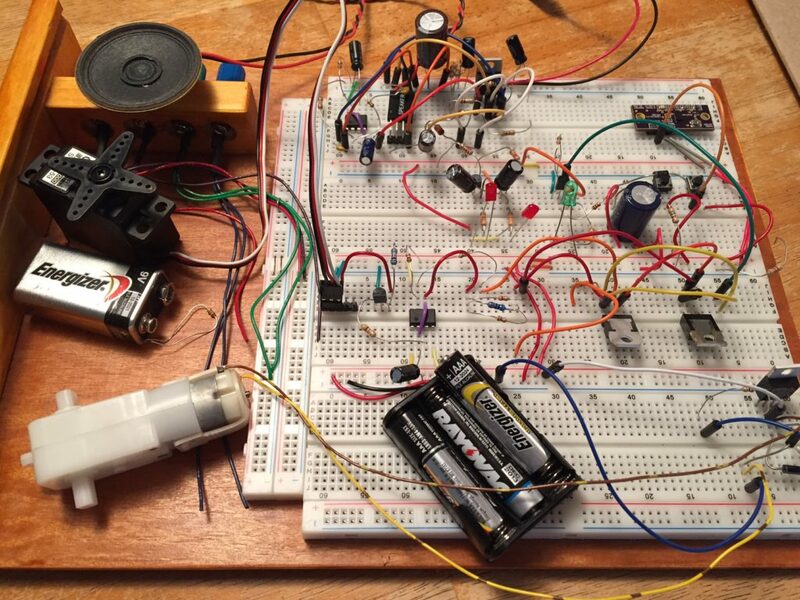 While we have been waiting for circuit boards for our Tiny Railroad Crossing Controller to arrive, we have been hard at work developing our next product; the Tiny Traffic Light. The Tiny Traffic light is an operational scale model traffic light head for use on model railroads and dioramas. This product is designed to work seamlessly with our Tiny Traffic Light Controller! We have developed traffic light heads for HO scale (1:87) and for N scale (1:160). The first step in the development of these lights was to design the circuit boards. These are extremely simple boards, with the pads to mount the LEDs on one side, and pads for soldering the wires on the other. Once these circuit boards had been made at a PCB fab house, we used a reflow oven and solder paste to solder the red, yellow, and green LEDs in place. Once the LEDs have been soldered to the boards, we prepared the foot-long wires for each traffic light head. Each light has four wires; red, yellow, green, and black for the common ground. Once the wires were soldered and the lights tested, the traffic light heads were ready to be cast in resin. While we were designing and assembling the circuit boards for the traffic lights, we simultaneously prepared to cast these lights. We started by machining a 3/4″ thick block of plastic into the positive shape, from which we would create a mold. This positive features 12 HO scale traffic lights and 12 N scale traffic lights. Each light is a solid rectangle with shallow dimples where the individual lights would be positioned. We left out the hoods over the lights to make the lights easier to see once the traffic light was installed on a model railroad. From this positive, we cast a silicone negative mold. This process went extremely well, even without a vacuum chamber. There are only a few minor defects in the mold, none of which make the mold un-useable. With this mold in hand, we could then cast the resin traffic lights. We used a simple resin, tinted yellow. After dispensing the resin into each mold, we inserted an assembled circuit board into each one. This way, the circuit board is encased in resin, making the traffic light one finished assembly! The resin also acts as a strain relief for the power wires, reducing the risk of accidental damage. It was extremely refreshing to try something new with these Tiny Traffic Lights. While we have had experience with casting, electronic assembly, and CNC routing, this was the first time we combined these separate skills to produce a finished product! 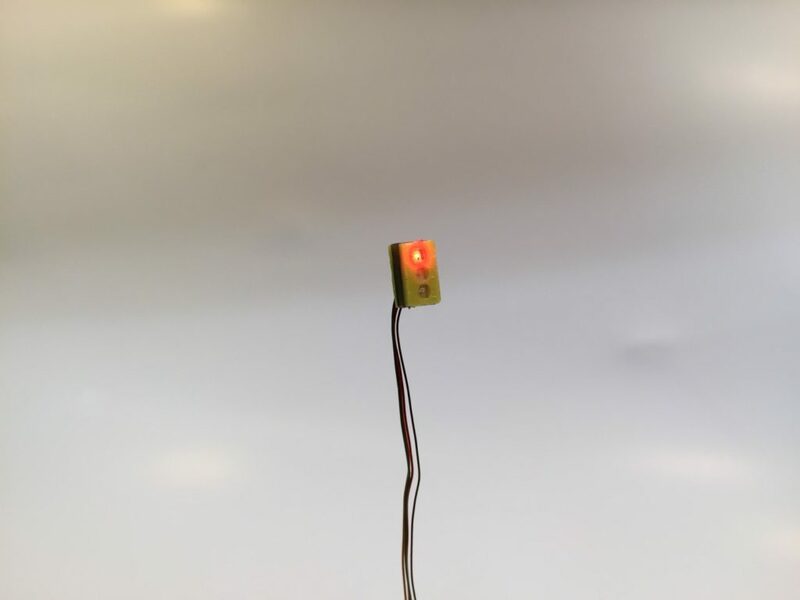 We are extremely proud of our Tiny Traffic Lights, and look forward to listing them for sale on our website very soon! Fellow model railroaders, be prepared for four additional new products from D5 DEM. We are in the design and prototyping phase for several different products which will being new levels of realism to the model railroading hobby. Stay tuned! At D5 DEM, we love taking on custom work. Often times, it helps give us insight into what our customers look for. Sometimes, a customer’s idea evolves into a new standard product offering from D5. But besides all that, we enjoy the fresh change-of-pace that this work often brings. Less than a week ago, a customer contacted us about building a pair of very large animal houses. 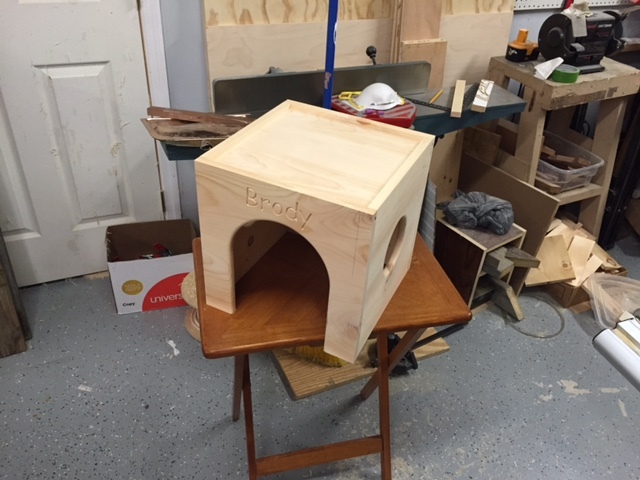 These houses were to match the design and look of our line of Small Animal Houses, but they were to measure 15″x15″x15″ and 13″x13″x13″. As is always our reply, I told the customer that we could absolutely accommodate this request. After settling on a reasonable price, I set to work on these two houses for a small dog named Brody. While the fabrication process of these houses is very similar to our standard houses, extra care had to be taken in wood selection and assembly. As 15″ wide boards are not commonly available, all ten pieces of these houses had to be joined as panels. We used biscuits with a biscuit joiner for added strength in these joints, and of course we had to ensure the biscuits would not later interfere with the door and window cutouts. Everything went smoothly on this build. Over the last three days of work, we have created two great dog houses which did not exist before. These houses are scheduled to ship today, and hopefully they will be to Brody’s liking! At D5 DEM, we take pride in our work. I am excited to have built these houses, and I think our customer will be excited to use them. The past several days in the shop have been spent developing our latest product for model railroaders; the Tiny Railroad Crossing Controller. This is our second product designed to enhance the realism of model railroads, and to bring real-life animation to these displays. The Tiny Railroad Crossing Controller is designed as an easy-to-use, all-in-one module for operating railroad crossings on model train displays. The animated effects are triggered automatically by proximity sensor modules mounted along the side of the train track. The when triggered, the controller starts flashing the lights on the railroad crossing signs, servo motors lower the crossing gates, and the bells start ringing. This controller also allows for the control of banjo-style signals with a standard DC motor. The lights and bell automatically turn off and the gates raise after the train passes. Like our Tiny Traffic Light Controller, this controller will be available as an easy-to-assemble kit. 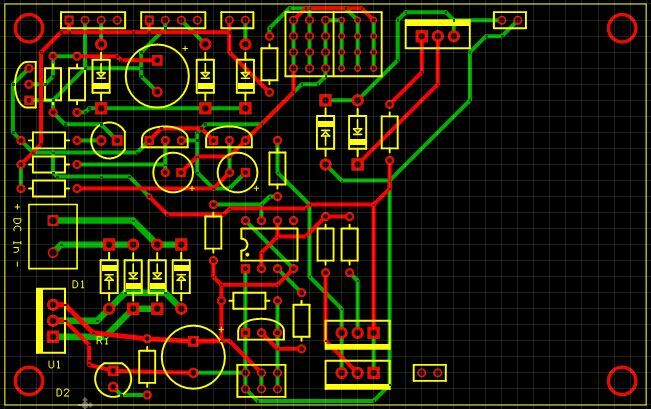 All components required to build the controller will be included, and the kit can be assembled and installed in an afternoon. The Proximity Prime Distance Sensor Modules used to detect the trains will be shipped completely assembled; they need only be plugged into the controller. Clearly, this new product is still only in development. However, we expect to have a production prototype prepared within a couple of weeks, and we will have units in stock by the end of August! If you have any questions or are interested in placing a pre-order on the Tiny Railroad Crossing Controller, please contact us at service@d5dem.com. Our CNC router has proven to be an invaluable tool in our shop. We completely designed and built it ourselves over six years ago, and we have been improving on it ever since. Originally, the machine was controlled using software called TurboCNC, however we have since upgraded to the Window-based Mach 3 by Vectric. This works in tandem with Vectric V-Carve, which we use to generate the G Code. 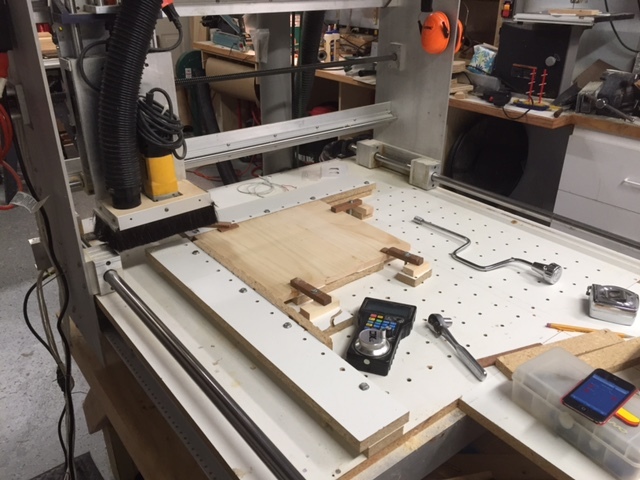 Other upgrades included a new driver system and beefier stepper motors, more rigid linear rails on the Y-Axis, a new DeWalt router, and a wireless jog wheel used to set up the machine for a cut. We have logged hundreds of hours of cutting on this machine, so it’s only right that we maintain it and give it some TLC every once in a while. One of the main issues that the router has had recently is that the gantry was out of square. This means that on all cuts, the Y-Axis was not 90 degrees to the X-Axis. This issue arises from the fact that the X-Axis utilizes two separate motors and ball screws to move the main gantry. Over time, as the gantry is pulled one way or the other, or it is crashed at its stops (which occasionally happens), the motors come out of alignment. I ran several test cuts to determine by how much the gantry was off. A test cut and a square showed that the machine was off by .05″ over ten inches. This is pretty significant, because this extrapolates to being off by about .15″ over the thirty inch spacing between the ball screws. So, I first disconnected the X-Axis motors from the driver. Next, I loosened the set screw on the timing pulley linking the two ball screws. This belt was intended to keep the screws in alignment, but clearly this has not worked great. In the future, we will probably install a tensioning idler pulley on the belt. However, after loosening one of the pulleys, I was able to manually rotate one of the screws against the pulley. This took a little guess and check, but it took approximately three quarters of a turn to realign the gantry, seeing as how the screws have a .2″ lead. One final test cut proved that the gantry was once again square. Next up, the linear bearings could use some lubrication. The Y-Axis rails and bearings had been replaced recently, so I focused only on the X-Axis for now. These bearings consist of two parts. There are the main bearings, which are mounted in aluminum blocks which are then mounted to the gantry. However, these bearings also have rubber wipers, which are held in place by an aluminum plate. After clearing the rails of sawdust, the wiper plates were removed and slid to the far ends of the table. Next, some heavy gear oil was laid on the rails, and I simply ran the gantry back and forth to work this oil into the actual bearings. The wipers and their mounts were cleared of old sawdust, and the wipers were replaced on the ends of the bearings, all while being careful not to get any dust inside the bearings. Following this procedure, the gantry moved noticeably smoother. The fences mounted to the table were only temporary to begin with. They were mounted to the table and trued up originally, however they were no longer true with the machine, and there were many marks from running the cutter beyond the fence and marks from general use. It was time for some proper fences. This table uses a 2″ grid with ¼-20 tee nuts with long ¼-20 bolts to secure the pieces to be cut. We have utilized some of these holes to mount the fence, and this has worked in the past. So, using the router, I mounted and drilled some fresh pieces of melamine with identically spaced holes. Then, the new fences were mounted in place using several of these mounting holes and washers. 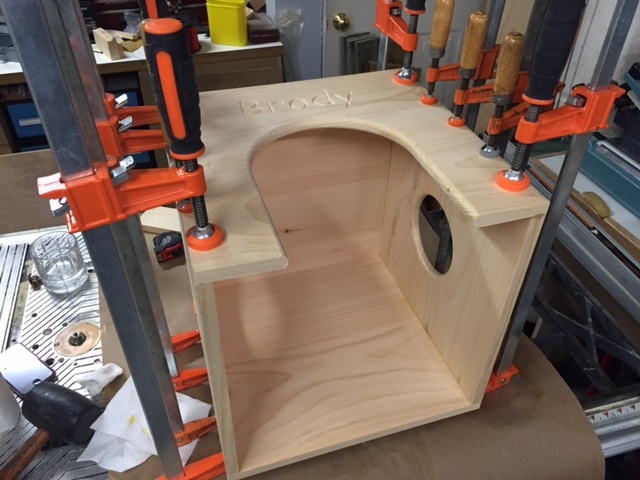 The upper piece was mounted with an overhang, so this upper piece would be the true reference. To true the fences, I ran the router in an “L” shape, cutting the leading edges of the fences true to the machine’s motion. One final measure with a square confirmed that the machine was now cutting true. More upgrades for our router will be coming soon. We are experimenting with the idea of using a vacuum top surface, eliminating the need for the 2″ grid to mount the pieces to be cut. Furthermore, we will be implementing a much-needed, proper dust collection system. Also, we may soon connect the limit switches, to prevent the possibility of crashing the gantry of Y-Axis. We take care of our tools, because they need to be ready to work when we need them. By performing this small amount of maintenance to our router, it will now run smoothly for another couple hundred hours. This blog series will be a place for us to show you the behind the scenes work we do at D5. We’ll share our workshop, tools, and methods we use on a daily basis while running D5. And, as we work on projects for home, shop infrastructure, and as finished products, we will include step-by-step descriptions of how we brought these projects to life. If you want a small preview of some of our work, check out the R5-D5 Droid Build blog, which outlines the process by which we build R5-D5, a soon-to-be fully functional astromechanical droid from the Star Wars Universe. Work at D5 will begin in earnest by May 2016, so be sure to check back then to see what we are working on! Boy, it’s been a while since I made an update. But a lot has happened. A lot of time was spent finishing the drive system. We finished machining down the wheel hubs, then stuck the hub and the axle in the milling machine to drill through them both. We then tapped one end of the hole for an 8-32 screw, and screwed them together. This is a nice, tight fit, better than you could get with a set screw. Then as for the motor shaft, we drilled a 6mm hole in the end of the shaft and stuck it back in the milling machine to mill for a set screw. Because the motor shaft has a flat, the set screw would work for this. Finally, I drilled in the other end of the shaft and tapped it for an 8-32 screw. This was my dad’s brilliant idea, and in retrospect, it really was a great idea. Basically, for dis-assembly, I can thread a screw into that hole and pull the shaft out. Otherwise, there’s no way I’d get it out. So that was all assembled, and the bearing block plates were glued in place. In the end, we doubled them up for strength, and because of their relative position with the opening in the bottom of the foot. I decided then was a good time to put R5 together, even with the shoulder hub positioning problem. So I ran wires to the motors, but not as a final assembly. I see now how difficult it’ll be to run the wires through the slots in the foot/ankle, so I’ll wait until final assembly. But I had those run, made up the jumpers to go from my receiver to the Pololu TReX Jr, and brought everything upstairs. I get it all together, hook up the electronics, and it works!! Almost. I hadn’t bothered to make the ankle lock pieces. Apparently, those are kinda important, because R5’s feet would flop around when he would roll. So the next day, I made them. When I screwed them in place, I accounted for the thickness of the .04″ skins that would go in place, even though I haven’t dome anything with them yet. For now, I’m using simple shim pieces. So I get those in place, and this time he actually works!! R5 could drive around!! I was thrilled. I was only annoyed with the speed. He didn’t seem to be going as fast as he should have. One test with the meter, and I see the motors are only getting 8.5 volts at full power. I run a simple calibration of my TReX Jr, and now they run at full voltage. He will go a little faster than he does now, but that’s because my battery is weak. I thought this was a pretty good milestone. I was satisfied with this. Of course, I don’t have the wheel for the dome motor yet. If I had that in place, that would be even better. Especially considering that the TRex Jr has a third motor output. Okay, almost caught up here. So after all that, it was time to break R5 down to fix the shoulder hub problem. I got the body up, and had a surprise about the glue I used. It’s strong!! After trying to pry apart the body, I can appreciate just how well that glue works. But I got it apart. After some careful-ish measuring/guesstimating, I found that I needed to shim the pieces .22″. This was achieved by gluing layers of thin scraps I had from cutting everything. So I glued in the wad of scraps, then glued the hub mounts back in place. I was not entirely sure about their parallel-ness, but I think it’ll be fine. Now, I could move onto the body. I taped up the inner skins, which fit well now with the shoulder hubs. They were taped, then glued from the inside. Success! Then, I spent a day or so cleaning up the outer skins. From cutting out the pieces, the inside corners all ended up rounded because of the cutter I used and because of limitations of the software. I made them nice and square. I then glued them on. It looks fantastic!! I have some gaps at the seams, but that was to be expected. It will be fixed later on when I prep for paint. Then this morning, I began cleaning and gluing a couple of the inset panels. That is where I am now. I have exactly a week until I go back to college, so progress will be slowing. It’s unavoidable, and I knew this when I jumped into this project. But all in all, this was a good way to spend my summer. So, I did a dumb. I had not moved ahead with the body skins, because I thought the arm boxes had to go in first because of the geometry of that space. Whoops. Apparently they don’t, which is good news for me since I don’t have the plastic to make them yet. So I decided to move ahead with skinning the body. I had cut the back outer piece earlier, so I next cut the inner pieces; front and back. I removed the door spaces for the four doors in front which I will have open. Next, I went about cleaning up the frame. 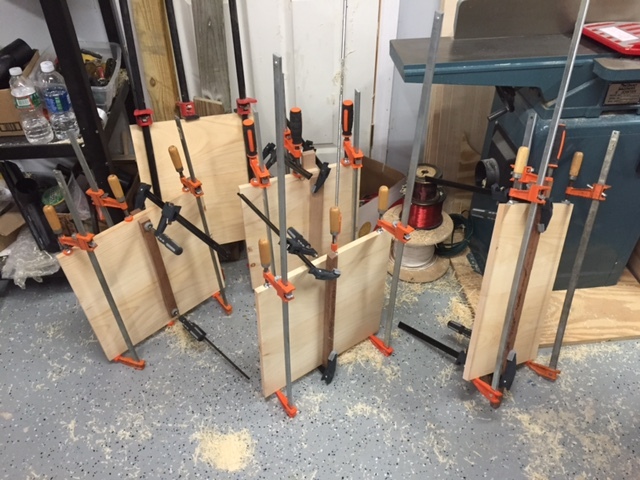 There were a couple high spots where the uprights met the rings, so they were trimmed and sanded. Additionally, the two front uprights (surrounding the vents) were a little out of position, so they interfered with the doors on either side. So I pulled them out, and will glue them in place when I glue the skins. I then worked out the hinges. I drilled and tapped holes for the large left hand door, where the hinges are actually inside the space. This way, they don’t interfere with the tall door right next to it. As for the small right hand door, I didn’t do anything with the hinge. I will probably use the identical setup, but I will make a separate mount piece and glue it in afterwards. After that, everything seemed to line up well. Almost. I get the front and back inner pieces all taped in place. I knew there would be a bit of a gap; I evenly put a 3/32″ gap on each side. But I then noticed a problem with the shoulder hubs. On both sides, the hubs seem to be too far forward, meaning that the front skin hits the hubs on both sides. And there is a big gap between the hub and the back skin on both sides. Now, I haven’t skinned the hubs yet, which means they probably wouldn’t even fit then. It looks like my only solution will be to remove the shoulder hub mount plates and shift them back. My motors came!! They are exactly what I needed, and they fit right in. I ran out yesterday and bought the metric screws to mount them. Other than that, I’ve been working on getting the drive train operational. I cut out bearing mount plates which will be glued in to support the axle. They were made as two half pieces just so I could use some of the piles of scrap I have left. But they fit together, and fit in, well. Other than that, we’ve continued working on the aluminum hubs. One is done, save for the pin . Tonight, I may be able to have at least one side together!! We’ll see how it goes, though. That’s about all the progress I’ve made. Today, I may work on designing the computer system. I really don’t know much about what’s out there, but I know my system will be self-contained. It will have motor output built in, sounds, radio control capabilities, speech recognition, obstacle avoidance, motion tracking, and more. I’m wondering if anyone would be interested in a system like this. Down the line, once I have my system dialed in, I would consider doing a run of these. Oh, and I’m going to have an IR remote link within the body, so the main computer communicates with the dome. This way, sensors, servos, and lights in the dome will be controlled by the main computer. This will give greater control than randomly flashing lights. I’m still making some headway, even though this is a secondary project. So when I realized that my R5 dome skins PDFs were squashed, I was a little bummed. I re-downloaded them, and I’ll be able to use them. I just wasted what precious little plastic I have. Anyway, the only other skin cutting I’ve done is the back half outer piece. I’m very happy with how it came out. I could (and probably will) cut all of the main body skins relatively soon. But again, I can’t glue on the fronts until I make the arm boxes, and I can’t do that until I have enough plastic. I have however begun work on the drive system. My motors aren’t here yet, but I’ve worked on the other stuff. I’ve decided that for the foot, just using the motor shaft to support the weight would not be enough. So, I plan on using 1/2″ axle and bearings to support the outside of the axle. Shortly, I will be cutting mount support pieces that i will use to screw the bearings on. Also, my dad graciously volunteered to turn my wheel hubs. We started with a pair of 1″x3″ round aluminum slugs. They were turned down to about 2.75″ diameter, have a 1/2″ bore, and a groove cut to accommodate the shape of the wheel. When they are done, they will taper, and use either a cold roll pin or a screw to pin them to the axle. Then the end of the axle will be drilled to 6mm, and a set screw will fix it to the motor shaft. Oh, and I am now using different wheels. The original pair I bought off of McMaster were terrible. They weren’t even round. Probably worth the money I paid for them, but they were unusable. So instead, I’m using these I bought at Lowes. I broke them down, and found that they would work perfectly. So the hubs were made to fit these wheels. I also have my caster all mounted, but I see now I haven’t taken any pictures. I’ll get some up eventually. And finally, here’s R5 as he stands. I’ve got the dome bearing all set, so that’s nice. So as you can see, I’m slowly making progress. I’ve got 2 1/2 weeks though, until work will have to stall. At least I’ll be able to work on the computer control while I’m at school. I’ve already mostly figured out how it will work.